But I could never expect my students to use a salutation in an email. Why is this? Because I have never used one, ever since starting with the medium in the mid-1990’s. Telex machine, very similar to the one used in my family business. You can click on the photo to find out what one sounded like. The reason? Simple: emails, for me, are a continuation of the telex, and I (and just about anyone else) never used them in the telex. 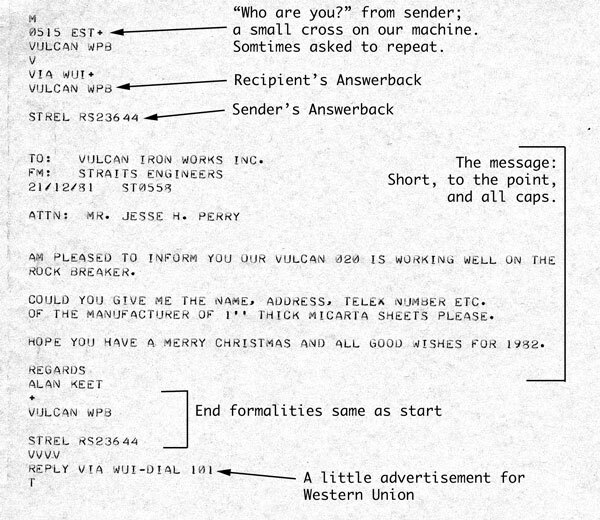 I have an entire page dedicated to explaining the telex, so you can find the details here. Although salutations are de rigeur for business letters, in the case of the telex they were not used for two reasons. The first is that they were expensive. Telex was usually charged by the word or letter; a salutation could be costly, especially if they were used with every telex. So we skipped them. A sample telex, dating from the early 1980’s. The elements to explain the telex are included. The second is that every telex had an answerback, which was an address for the telex (like a phone number.) So it was unnecessary to do a formal address (like a letter.) Since most telex machines were “one to an office” you used an attention line to direct the telex, like you did in a memo. A salutation in that case was redundant. Telexes also used common abbreviations like we do in texting, but you have to be careful to make sure your recipient is “with it” enough to figure them out. My family business usually spelled things out. Since I made a fair amount of my living with the telex, it only made sense to continue the success with emails. It is true that emails aren’t charged by length (or usually at all) but all of them have sender and recipient at the top. And an email goes directly to the recipient. However, there are two things that students (and everyone else) can do with email to make things nicer with the recipient, and to get a meaningful answer. The first is to really explain what you’re trying to convey. Many times I feel like I’m getting the middle of a conversation in emails (and sometimes blog and fb posts as well) without really understanding what’s going on. The second is, for those who insist on using salutations, to ditch the wimpy “Dear…” we use in English for something better. The Russians, for example, address their letters using “Esteemed (name)!” Formality increases when we see “Much Esteemed (name)!” and “Deeply Respected (name)!” Since academics tend to be, er, a little conceited, this should boost a student’s standing with his or her professor. One thing from Telex days I would avoid is all caps. With the telex we understood that’s just the way it was; it shouldn’t be that way now.